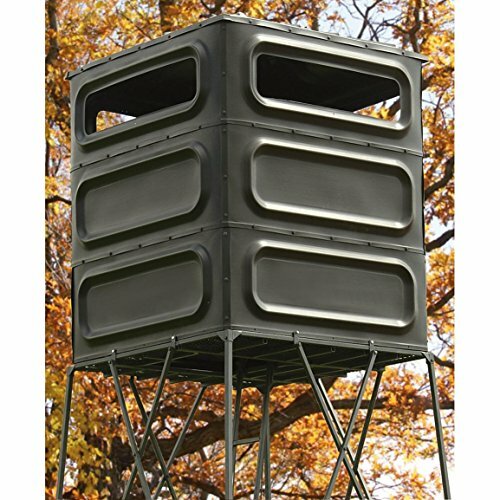 This deluxe, sturdy, well-designed Box Stand is your hunting "treehouse", getting you elevated, hidden and comfortably protected. It can be set up almost anywhere and sure beats shivering out in the open. The supporting platform is 48 x 48" (4' x 4'), 10' height. Sturdy made of steel, powdercoated to prevent corrosion. 9" wide climbing steps, with handrail and 20 x 20" flip-up trapdoor entrance for easy in / out. Durable walls and roof completely keep out harsh weather. 48 x 48" interior, roomy for 2. Plexiglass windows (4, for a 360° view, each 34 x 8"h.) deflect wind, rain and cold. Windows open for shooting. Bungee system keeps them closed and 20 x 20" roof opening for an aerial view.